Having a taifun or other bad weather coming in over the weekend is not the optimal condition for going for a long climb. 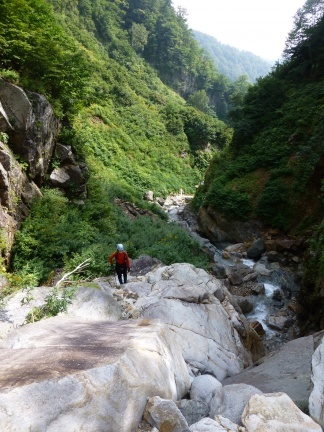 So, instead of enjoying three days in Kamikochi, we decided to climb a long river on Hakusan from the Gifu prefecture side, Oshiramizutani 大白水谷. After arriving at the parking lot and some preparation we entered into the river at 7am. I am still using my first Sawa shoes (see above photo) which are like thin socks. Today was the first time that I tried to evade splashing through the water, because it was so cold. 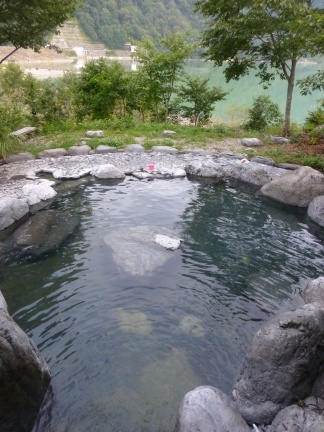 The water here is known for its emerald and white color, and its high sulfur percentage due to the volcanic origin. Along the river there are many steps and waterfalls, the longest being 30m. All of them can be climbed directly without the need to crawl around in bushes and mud. 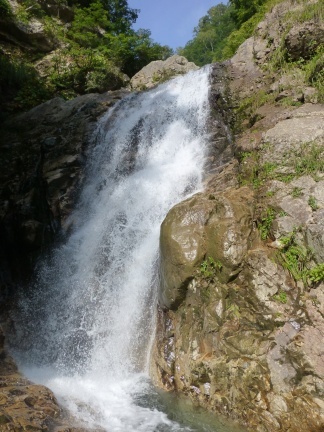 Only once we made a detour, because I didn’t want to swimm to one waterfall, due to water temperature. 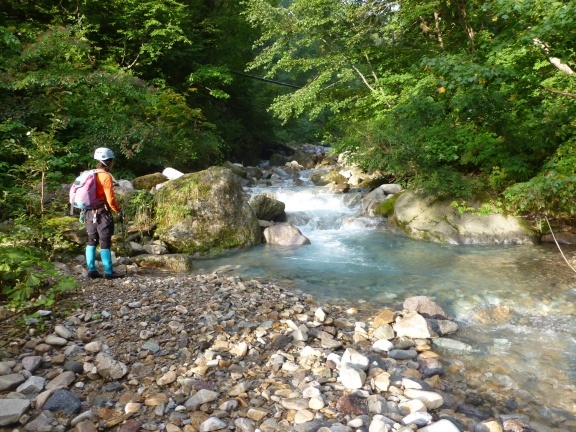 The river follows a long valley from down in Gifu right up close to the Murodo. In the upper parts the vegetation changed a bit, bushes and trees give way to meadows and high grass, which gives a bit an alpine feeling (besides the humidity, and the fact that we are climbing up a river, very uncommon in the Alps). 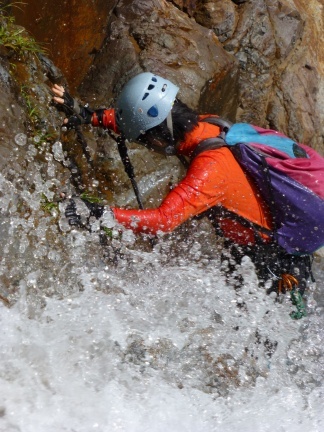 The level of water was quite high, which made it a bit more challenging than expected, but also lot more fun. Overcoming a waterfall in full splash gives you quite some satisfaction. After the end of the river we changed into hiking shoes and continued along the now dry river bed direction to the ridge. At some point we had to cross some bushes, where – to our great enjoyment – we found huge amounts of raspberries and blueberries. 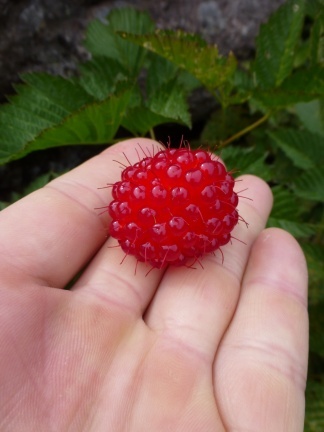 This particular raspberry was enormous. And all of them very tasty! Our original plan was to return after we have reached the ridge and hiking path. But since we managed to get out in about five hours, and despite the weather forecast it wasn’t raining, we continued the short hike to the Murodo. With the knowledge that after returning to the parking lot I will drive the car, I counted the hours: break and up to the top: 40min, break and down to parking lot: 3h++, Onsen and space out time: 1h. Yeah, that is enough. Get me one beer!!! 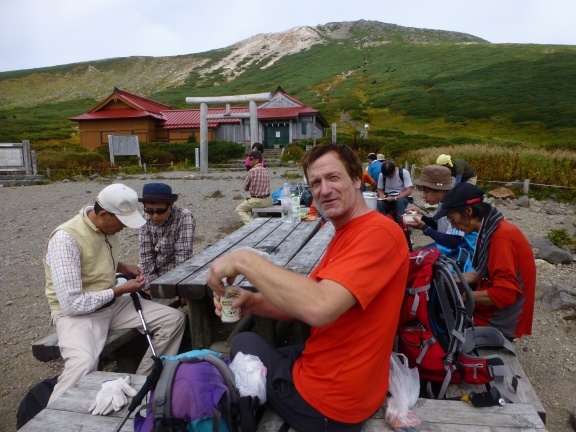 Ah – a beer after a sawa, and before climbing up Hakusan, that is like paradise! Up to the top I pushed myself so that I managed to reach the top in 22min from the Murodo, arriving there exactely 7 hours after our departure from the parking lot. The first steps with the beer in the blood were the hardest. M came a bit later and we enjoyed a short break with relatively good sight from the top of Hakusan. It was the first time for me in summer, the second time total. The first time I climbed Hakusan in winter with skis. After three hours we were back at the parking lot, where the nearby rotenburo-only Onsen was our first target. 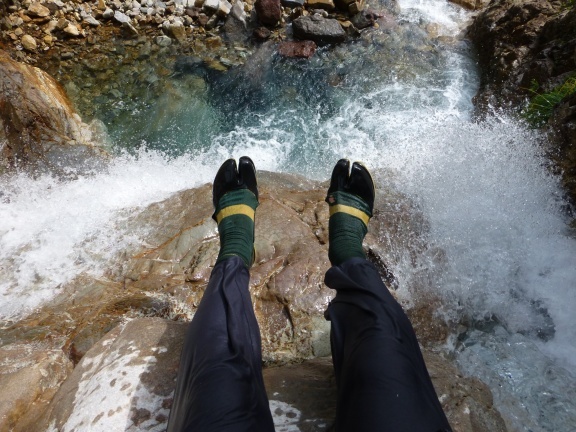 Soaking the hurting legs and toes in hot water while enjoying the view, a precious experience. All in all a wonderful day, the perfect plan for a bad weather weekend. The following days brought the taifun and heavy rain, time for working on Mathematics. Thanks M, for taking me with you to this trip. 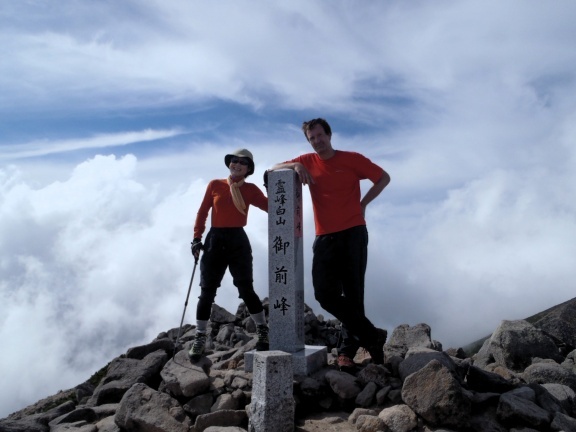 More photos can be found at my photo site: Oshiramizutani and Hakusan 大白水谷と白山 September 2013. Todays trip can be found in the following kml: 2013.09.14.Oshiramizutani-Hakusan.kml, as well as be seen in the map below.